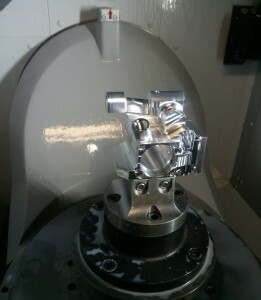 Machined actuator housing after the first operation. We use our Mori Seiki NMV3000 to nearly complete this complex part in a single operation. After this operation we move the part to a vertical CNC mill to face off the bottom clamping surface and profile the round outside diameter to complete machining operations.